A minimal jewelry design for women. This set of raw copper arthritis bracelets have a pretty dappled textured surface on the front side and are finished with softly shaped paddle ends. These designs leave the copper raw, which are suitable for arthritis sufferers who wish to wear copper directly against the skin. The copper has been shaped to follow the curve of your wrist and lightly hammered with warm copper colours and metallic highlights. This women’s bracelet design is a contemporary take on copper jewellery for arthritis. A minimal metal bangle with a small decorative opening, where the ends of the wire have been hammered into softened paddles shapes. The surface of the copper wire has been textured with gentle hammered shapes that reflect the light. The design is right at home with the stacking bangle trend. This women’s bracelet design is a contemporary take on copper jewellery for arthritis. 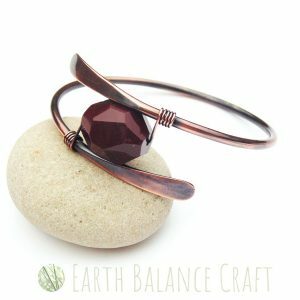 A hand-made copper wrap bangle featuring a large faceted mookaite gemstone as the centre piece. Mookaite is an opaque stone that has purple and red tones, it is of the earth and for grounding. Designed with a minimal style of wire work and a gorgeous rustic patina of the copper metal. 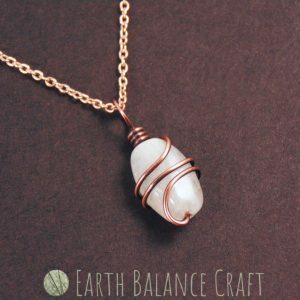 This delicate little pendant features a copper wire wrapped rainbow moonstone. This minimalist micro jewellery design is inspired by late winter, when snow drop petals begin to bloom across the forest floor, symbolising the return of life to the earth after the cold dark winter. 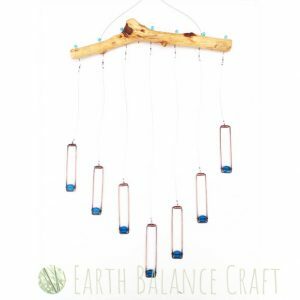 An abstract geometric copper mobile with rectangle shaped droplets each with a bright blue glass bead sat at the base of the metal frame. This pretty hanging decoration is inspired by summer rain, when rain drops are rolling off tree branches, pitter pattering on the forest floor. The wire droplets have a kinetic quality, each have a swivel barrel at the top which means they can move around 360 degrees with free movement. 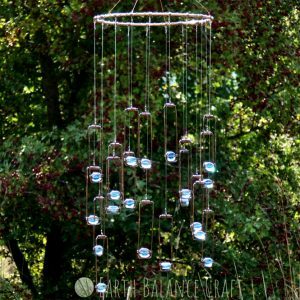 Hang this metal mobile on you wall or in your window for lovely flashes of blue light as the sun catches the glass. A rustic geometric mobile with circular patina copper wire work droplets that are wrapped with watery dew drop gemstones; rainbow fluorite, labradorite, moonstone, prehnite and quartz. This window decoration is inspired by a walk through the forest on a misty morning when dew drops have formed on tree branches, like sparkling lights as the sun begins to rise. The top of the mobile is a polished tree branch without its’ bark, that is warm and tactile. Each hanging line has a swivel barrel at the top which means the drops can move around 360 degrees freely. All of our mobiles and suncatchers come to life in the sunshine, with bright flashes of rainbow coloured light.